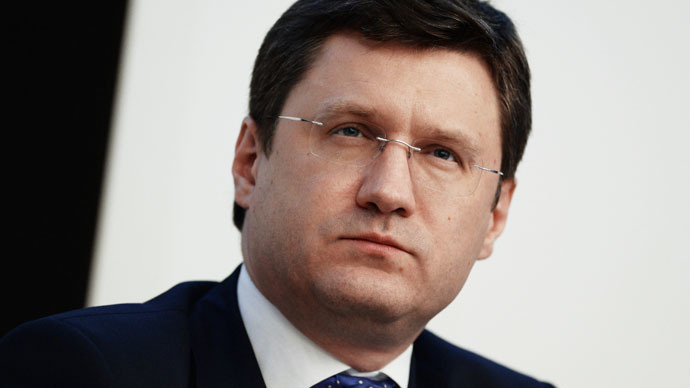 In an exclusive interview with RT, Russian Energy Minister Alexander Novak talked about the prospects for technology intensive oil production in Russia and the world, and discussed investment in the Russian oil and gas industry. RT: Despite oil prices going down, the number of tight oil rigs is decreasing at a slower pace than expected. In some cases, the companies were able to cut down production costs and increase production while using fewer rigs. Based on this, experts are drawing the conclusion that the price war in the oil market is only beginning. Do you agree with this assessment and what is your vision of the future in the tight oil production industry? Alexander Novak: There is no price war. There is a market, there is demand and there is supply. That’s what determines the price. We shouldn’t forget about market cycles, either. Prices dropped because the large inflow of investment into the industry generated a large number of expensive projects while the prices were still high, and that drove up production to the level to where supply exceeded demand. Tight oil production is a technology intensive process, compared to regular oil. That means that when prices plummet, investment runs low. And this was exactly our expectation. Back in autumn, we projected that it would take 6 to 9 months for this process to gain momentum, and after that investment would start dwindling and tight oil production would go down. If we look at the USA, we see that in May production results showed a decline compared to the previous month’s performance for the first time. As for the number of tight oil rigs going down, that’s a natural process. I think we can safely say that their number decreased about 2.5 times – from 1,600 down to 600. That certainly means we are looking at an outflow of investment – although, on the other hand, many tight oil producing companies are working actively on increasing their efficiency, bringing down production costs, and finding new ways of tapping the old rigs and implementing new technologies. This stimulates cost optimization, and that’s the reason why I think tight oil will be quite competitive on the market next to regular oil. That is especially true since, with time, the share of technology intensive oil production will only grow. If today’s volumes can be assessed at about 23%, by the year 2040 we’ll be looking at 56%. According to our projections, by 2040 a total of 65 million barrels of tight oil will be produced – that’ll be offshore oil, shale oil, bituminous sands oil, deep sea oil. RT:OPEC has announced that its strategy aimed at ousting shale oil from the oil market has proven effective. Will Russia do anything to affect shale oil production? What means are available to that end? AN: None of the parties have taken specific measures for that purpose. Essentially, we are all competing in a market where supply exceeds demand. As a result, costly and inefficient projects are becoming obsolete. And shale oil has its own expensive projects, as well as economical ones, with prices ranging between $20 and $100 per barrel. According to our assessment, shale oil ventures must go out of business once the average price drops to some $50-60 per barrel. Right now, we’ve got a borderline price, which seriously affects the supply and demand ratio and outflow of investment. RT:Russian companies have also started up some shale oil production projects. Considering today’s oil prices, is investment in such projects in Russia justified? What is the price level that would make shale oil production in Russia cost-efficient? AN: It is true that we encourage tight oil production – we prefer to call it tight oil rather than shale oil. We are talking about oil-bearing strata such as the Bazhenov formation and the Achimovo formation. They have huge oil reserves, but we are saving them for long-term development, for the future. We are working on creating favorable tax conditions. In Russia, production costs are quite low, and the tax burden is quite significant given our legislation. That means that any tax breaks are sure to stimulate production. As of today, all the projects involving Russian companies are still active. Due to the sanctions imposed against the tight oil production industry, a number of overseas partners chose to step out of some projects. However, this has had no significant influence on the production of this type of oil, and our domestic companies keep up their work. RT: Russia’s energy strategy relies on significant growth in production through developing new fields. What are the plans concerning investment in new fields with the price that we have now? Will the level of investment stay the same or should we expect reduced production? AN: We are adjusting the strategy at the moment, taking into account the current situation on the market and lower prices. It is hard to give any long-term prognosis, but we understand that in the next couple of years the price will stay low, like it is today, or maybe just a little higher. So the strategy has been adjusted, but the price of oil in dollars is not the only factor here. There are also our domestic economic policies, government incentives, and ruble’s exchange rate against the dollar. As of now I can tell you that in 2015 we’ve seen no significant reduction of investment into the oil and gas industry. For us, the lower price was balanced out when the ruble dropped against the dollar. So we have to consider all these factors. RT: You’ve talked about the possibility of building a gas pipeline in India. What is Russia’s potential on the Indian energy market? AN: There’s a lot of potential. At the moment India consumes very little gas, but its large population needs modern energy consumption services. In my view, India will grow faster than any other country in the world economically as well as in terms of energy consumption. Therefore there’s a large potential for both pipeline gas supply and LNG gas supply. RT: Do these closer relations with India and China indicate that Russia has a new energy doctrine? AN: This doctrine is not really new, because the Russian president and the head of the government set the objective a long time ago. They tasked us with initiating and developing trade and economic relations with Asia Pacific countries. Energy is one of the components here, and we have been working on a number of such projects with China and India for a few years now. Our intergovernmental commissions have designated working groups. There are many projects in oil and gas, the coal industry, and electrical energy. So I think we consider these countries big markets with great potential, so we need to work together with our partners. These countries are interested in a safe and stable energy supply, in doing joint projects, and we are interested in developing our eastern regions, that can work with our neighbors, develop natural resources, contribute taxes, and create jobs exporting energy as well as technology to Asia Pacific. RT: Countries that are not OPEC members are starting to play a major role. Where do you see that? AN: Let me give you an example. Countries that did not produce their own resources before and had to buy energy could not influence the market, because the exporters were the ones initiating and controlling all market activity. But now, with new technologies, more countries are producing energy, reducing imports and demand. We can see this in the US, where in the last few years oil production grew from 4 million barrels a day to 8 million barrels a day. This is a big jump, which reduced their import demand significantly. So they produce more, they can cover more of their needs, and this way they are influencing international markets, because there is now extra oil, the amount that used to go to this importing country. So when some countries suggest that we reduce our oil production together, it means that this is not a long-term solution, which will not benefit the oil and gas market in any way. Prices will go up, so the importing countries will be able to increase their domestic production, which will only hurt the market further, upsetting the supply and demand balance. So the best scenario in this situation is going with the market, when the price is based on the supply and demand balance, and reflects the real situation with investment that would be beneficial at this price. And this is exactly how the oil market is developing at the moment.